In this review you will learn why we recommend extreme caution when dealing with Banc de Crypto. Banc de Crypto is a cryptocurrency investment fund that allegedly is managing a portfolio worth several tens of millions of dollars. It allegedly invests in ICOs and does manual trading and algo-trading. This should generate profits up to 30% per month to you. So, is Banc de Crypto a genuine investment opportunity? We see several problems with Banc de Crypto, which makes it a service that is not trustworthy in our eyes. Banc de Crypto doesn’t provide any real contact information, which is already a warning sign. They only say they have people in the US, UK, Czech Republic and Thailand. Fund managers are allegedly in London and operations in Prague. Both the UK and the Czech Republic are EU countries, and investment services are heavily regulated in the EU. So, Banc de Crypto needs to be regulated in at least one of the EU countries in order to be allowed to operate legally, but it obviously isn’t. Our conclusion therefore is that Banc de Crypto is an illegal business. 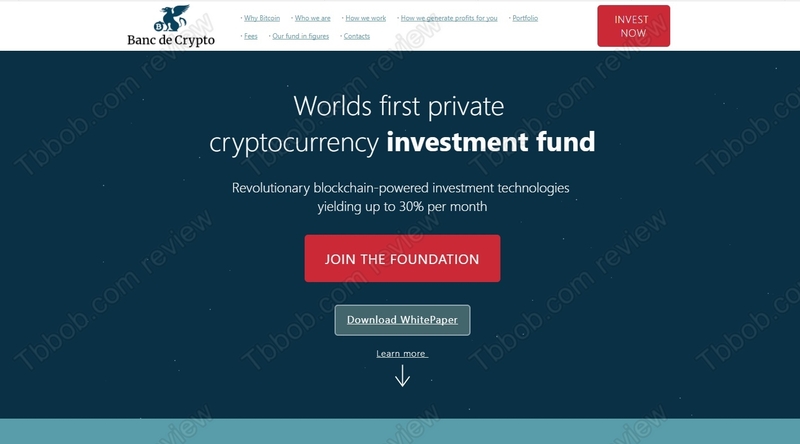 Your money would not be protected in any way, should you invest with it. 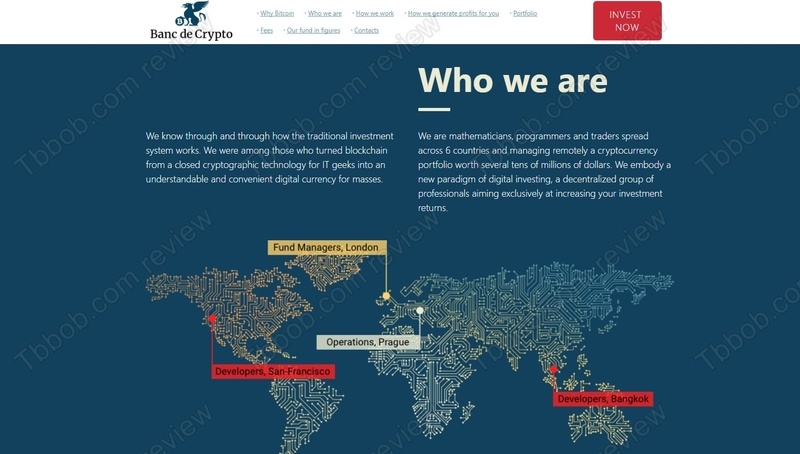 On the Banc de Crypto website you will find information that is not true. For example that Bitcoin transaction are fast, that they are performed in a fractions of a second. In reality Bitcoin transactions a slow, nowadays it takes long hours for them to settle. Another example, Banc de Crypto claims that Bitcoin profits cannot be taxed. In most countries profits from cryptos are subject to taxes, once you convert them to fiat. If you don’t pay your taxes, you are breaking the law. Banc de Crypto claims to be managing a portfolio worth tens of millions of dollars. Where are proofs? They could at least provide Bitcoin addresses so that anybody can check their accounts on the blockchain. Also, Banc de Crypto claims to be employing mathematicians, programmers and traders from six countries. Who are they? Where are proofs and more information? Basically, any claim of Banc de Crypto is not backed by anything, which is a serious problem with an investment fund. 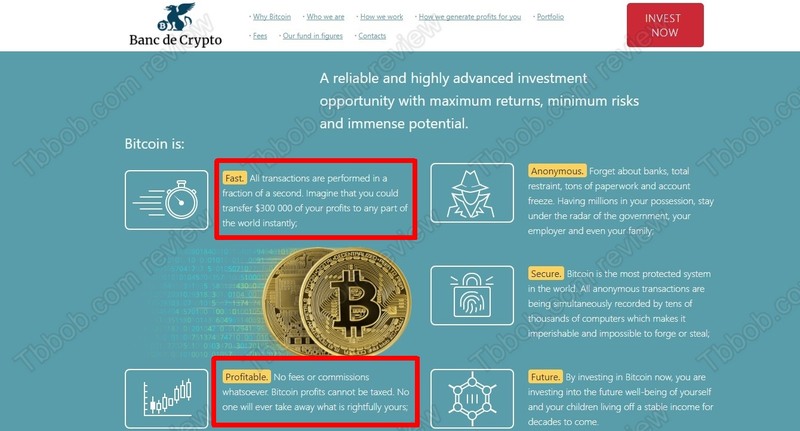 We had a look at the blog of Banc de Crypto and we found that the authors are fake. Check our picture and you will see that this so called expert is obviously fictitious. His picture is in reality a stock photo, see the proof on the right. This is another problem that makes Banc de Crypto questionable. Banc de Crypto is not regulated, although it should be, and it is providing incomplete and misleading information, which makes us believe that you should avoid it. We believe that instead of relying on somebody else to make you money in crypto trading, you should do it on your own. You can try a free demo account with a regulated broker to see if you could succeed. Trading is risky, so be sure to understand everything before you eventually invest real money.